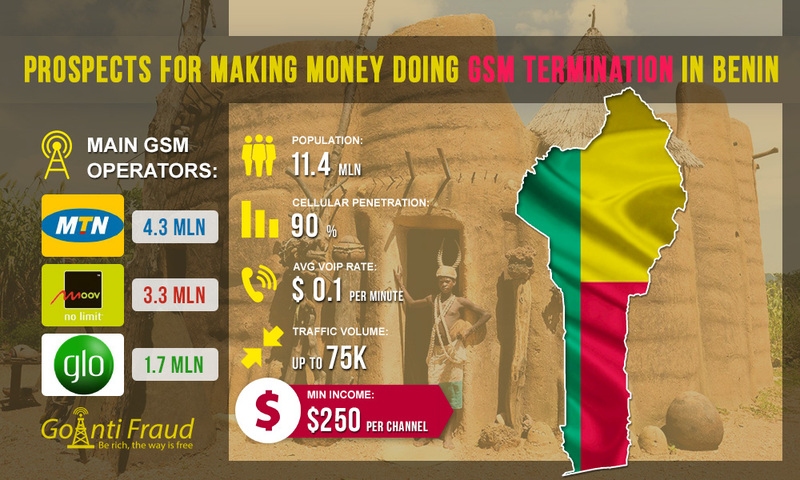 The African country Benin attracts terminators with a high enough rate, which is 10 cents per minute of the call. In Benin, the market of Internet services is poorly developed, and very few people use fixed communication. But mobile networks in Benin account for a large volume of voice traffic. This opens up ample opportunities to make money doing the VoIP termination. On average, original companies offer 30-75 thousand minutes for the termination in Benin. The largest mobile operator in Benin is MTN as its subscriber base consists of over 4.3 million people. The second place on the market is occupied by Moov Etisalat, which is used by about 3.3 million people. The third largest number of subscribers belongs to Glo Mobile (1.7 million users). The cost of a SIM-card in Benin is about 50 cents. The average cost of a minute of a local call is $0.5. At the same time, the rate in this direction is $0.1 per minute. If you install gateways in the country and terminate 5 hours a day, you can earn at least $250 via each equipment channel.